Emil Hoppe (1876 Vienna – 1957 Salzburg) was a successful Viennese architect and designer and the grandson of renowned Biedermeier era architect, Anton Hoppe. He was also associated with the Wiener Werkstätte (Vienna Workshop), the art and design manufacturing and sales collective founded in 1903 by Josef Hoffmann and Koloman Moser, that pursued the ideal of the Gesamtkunstwerk (total artwork), a unification of artists and craftsmen of different disciplines in the creation of an overarching lifestyle concept. Hoppe studied at the Staatsgewerbeschule (State Trade School) in Vienna and then at the “Wagnerschule” (Wagner School)—so called because students in this program were under the guidance of architect Otto Wagner—at the Akademie der bildenden Künste (Academy of Fine Art). In 1901, Hoppe was awarded the Schwendenwein Stipend and used the money to travel to Italy. The accomplished and imaginative architectural drawings he created there were published in the Wagnerschule yearbook in 1902, and were influential among architects in Vienna and beyond. From 1902-1909, Hoppe was an assistant in Wagner’s studio, where he worked on major projects such as the Post Office Savings Bank and the Steinhof Church. Hoppe also worked independently during this time, on architectural and design projects. He contributed to the design of the 1908 "Kunstschau" (Art Show), which highlighted the Wiener Werkstätte and the Klimtgruppe (Klimt Group)—a group of artists, led by Gustav Klimt, that had broken away from the Secession. 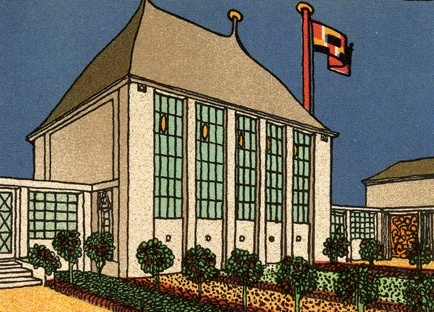 Hoppe also designed several postcards picturing the "Kunstschau," which were the first in the Werkstätte’s series of nearly one thousand numbered artists’ cards. Thereafter, he continued to design Werkstätte postcards. In 1909, Hoppe began an architecture and design practice with Otto Schönthal, which was later joined by Marcel Kammerer—all three were outstanding students at the Wagnerschule and colleagues from Wagner’s studio. The firm, combining the use of new materials and techniques with an awareness of traditional Viennese architecture, played an important role in the development of Viennese modernism in the years before World War I. These were the glory years for Viennese architecture, and the practice flourished. Among notable projects was the interior design of the Austrian pavilion at the "Esposizione Internazionale d’Arte" in Rome (1911) and the apartment building at Wiedner Hauptstrasse 126-128 in Vienna (1912-1913). The firm’s work, however, was interrupted by the war. During the austere post-war years, Hoppe and Schönthal continued to work together, most significantly on Vienna's social housing program in the 1920s and 1930s. Their practice closed with the Nazi annexation of Austria in 1938. After World War II, Hoppe had his own office and worked on the restoration of his buildings that had sustained war damage.